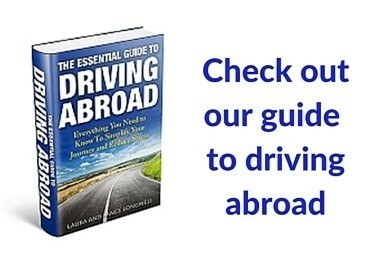 Athens to Zagreb – we all feel like we know the capitals of Europe. Yet we don’t know that Regensburg, Germany was once such a capital city. This often overlooked town on the Danube River made a big impression on me. 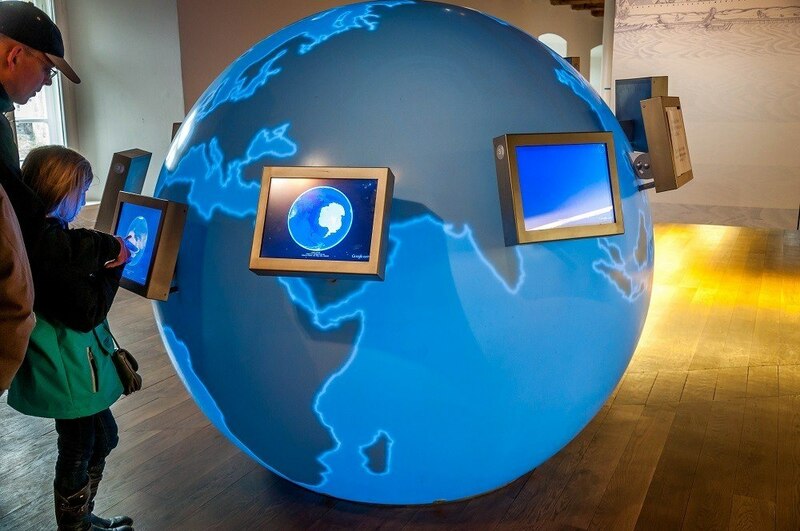 We’re passionate about visiting UNESCO World Heritage sites and Regensburg received this designation in 2006. The city is recognized by UNESCO for its perfectly preserved old town (and the medieval architecture located therein) and for its cultural importance from the High Middle Ages right through the Holy Roman Empire. 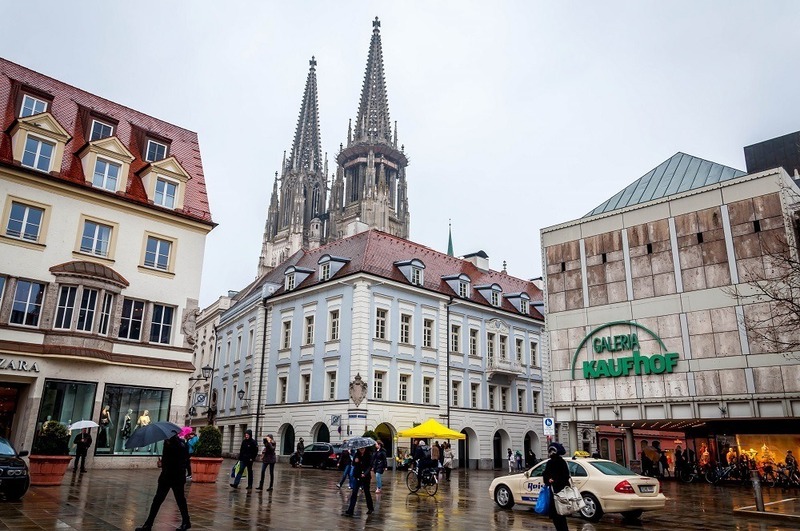 Check current hotel prices in Regensburg here. Regensburg is Europe’s forgotten capital city. During the Middle Ages, the Imperial Diets (General Assembly) met for nearly 1,000 years in the city of Regensburg. From 1663-1803, Regensburg was the Parliamentary seat of the entire Holy Roman Empire. So, from 788 to 1806, Regensburg was one of the most important cities in Europe. Yet today, the city is practically bucolic – a quiet town frequented by river cruise tourists in the summer and largely ignored in the colder months. In all of my many trips to Germany, I’ve always wanted to visit this UNESCO World Heritage city. Finally, after 10 years, I made the trip to Regensburg. And it poured rain. And it was cold. Yet the weather could not dampen my spirits as I fulfilled my dream. 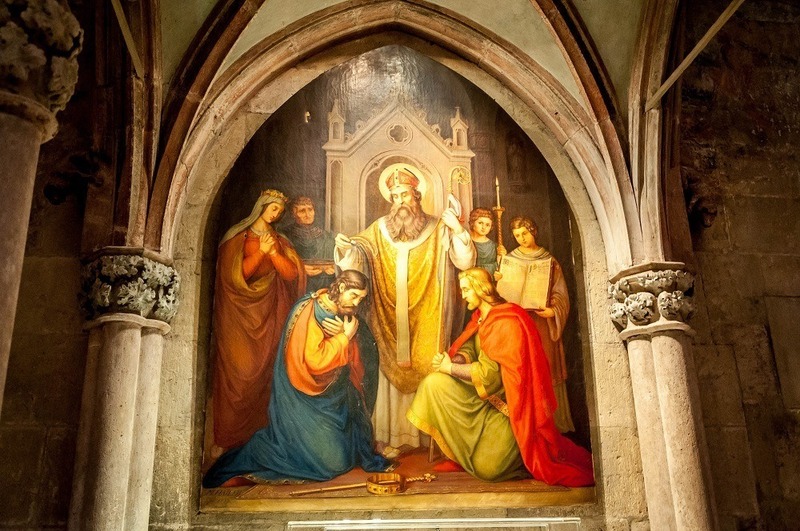 Given the pouring rain, I spent a lot of time in churches – and Regensburg has many of those. 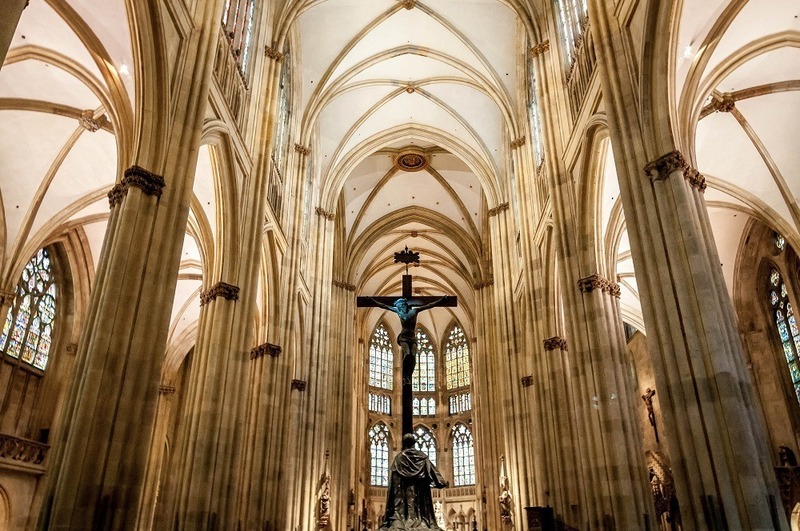 Visiting churches is one of the top things to do in Regensburg. The city’s skyline is dominated by the twin, gray cross-topped spires of Dom St. Peter (St. Peter’s Cathedral). First begun in late 8th century, the church was rebuilt after a fire in 1273. 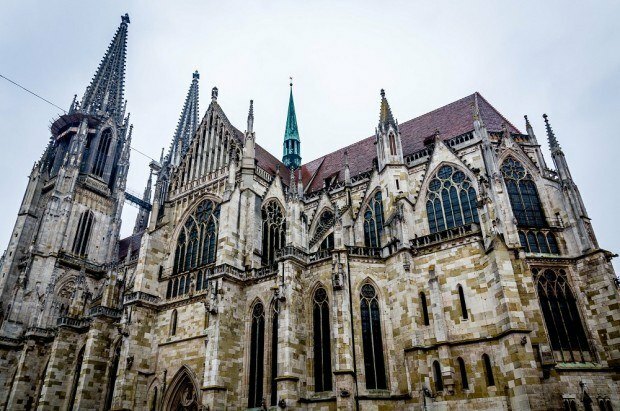 In the late 1880s, this once-baroque church was refashioned into a Gothic cathedral – the finest such example of Gothic architecture in southern Germany. 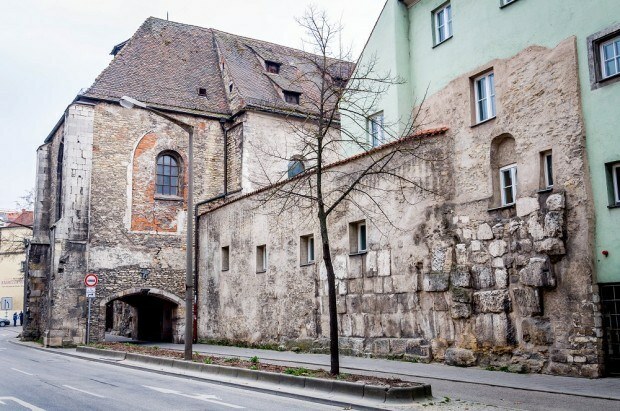 However, what I found most fascinating is that the cathedral was atop the hill just above the Porta Praetoria, a stone gateway dating from 179 A.D. Regensburg was actually a Roman military outpost called Castra Regina, and this was one of the fortifications. All over Regensburg, you’ll see remnants of the Roman walls that have been incorporated into other buildings. By the far, the most intriguing building in Regensburg is the Alte Kapelle (The Collegiate Church of Our Lady, the Old Chapel). This is a rococo church (with a little early baroque in the mix). The defining characteristic of the Old Chapel is the gold leaf – everywhere. It’s like someone vomited gold leaf. Originally built in the mid-800s, it was rebuilt by Emperor Henry II and overseen by the diocese of Bamberg (also a UNESCO World Heritage city). The pews are closed off by an imposing iron gate, but I was able to stand at the back and take in this golden beauty while listening to the pouring rain outside. 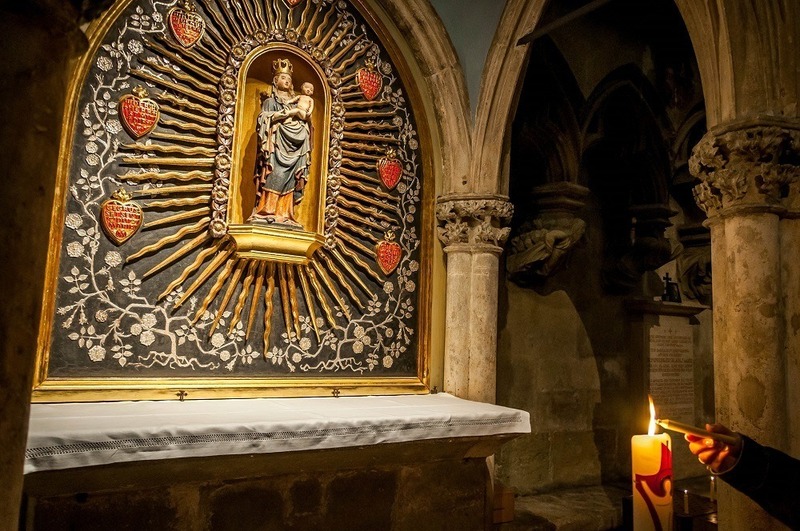 For me, the Alte Kapelle is the highlight of the churches in Regensburg and not to be missed. A final notable church is St. Emmeram’s Basilica, part of the old Benedictine monastery. One of the best things to do in Regensburg is actually walk along the banks of the Danube and take in the sights. Rows of river cruise boats are lined up here waiting for the busier summer months, but nobody was sailing in the cool early spring. Despite the weather, the bratwurst and sausage vendors were out in force – it made a cheap and quick lunch. The ducks on the Danube were hoping I’d throw them a bite! It seems that all roads in Regensburg lead to the Steinerne Brucke (Stone Bridge). 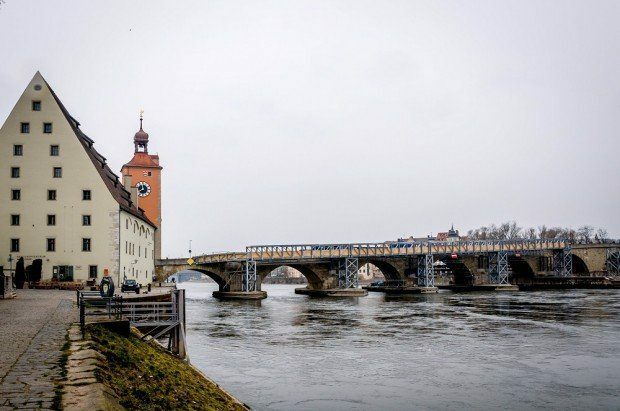 This bridge dating from 1146 was the only bridge crossing on the Danube between Ulm and Vienna for over 800 years. The bridge was so well constructed that it served as the model for other bridges in Europe, including the London Bridge and the Pont d’Avignon. 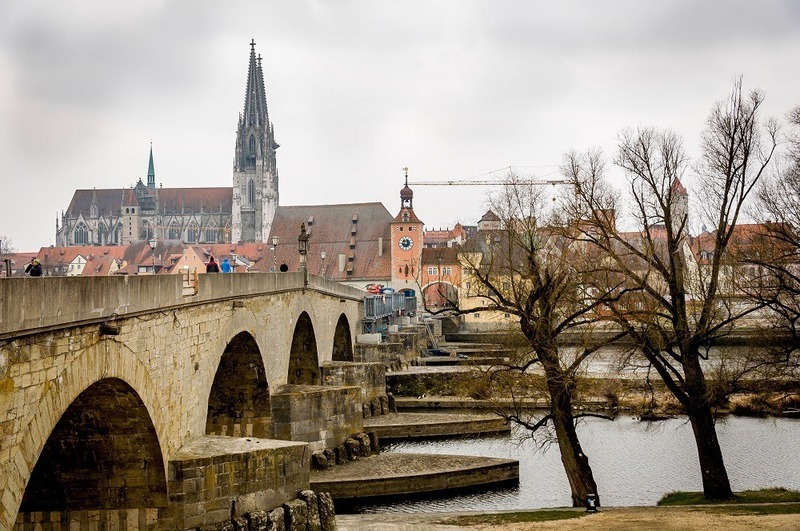 I encountered a bridge covered in scaffolding and undergoing repairs, however, it did not diminish the views of the Regensburg skyline that could be seen from it. At one end, The Bridge Museum has an excellent UNESCO World Heritage Visitor Centre. 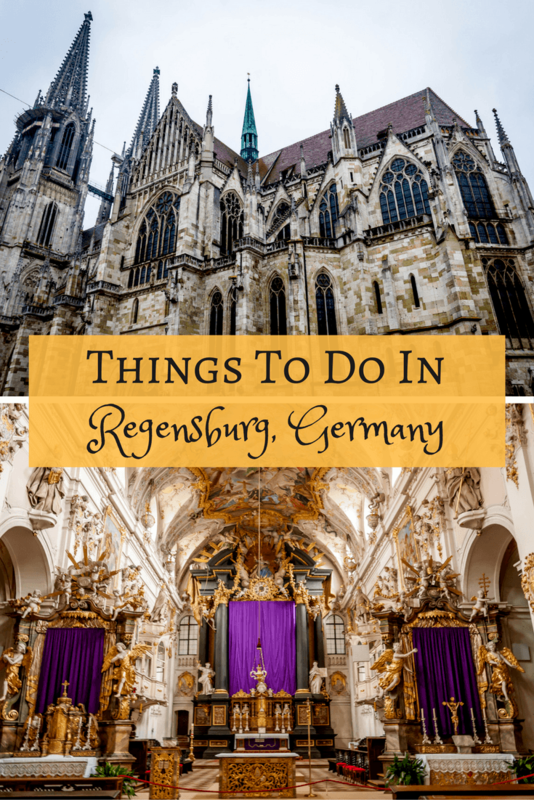 There are a lot of things to do in Regensburg. I was easily able to fill a whole day exploring the city. Had it been better weather, just sitting on the banks of the Danube with a picnic would have been a delight. Have you ever been? We’d love to hear your favorite things to do in Regensburg! 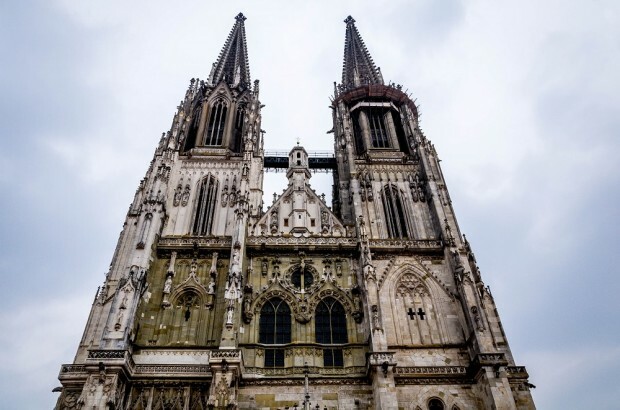 What do you think about Europe’s Forgotten Capital – Regensburg, Germany? Regensburg was not destroyed during the WWII, the city is one of the best preserved in Germany. Very nice and attractive city. And thank you for your post!!! 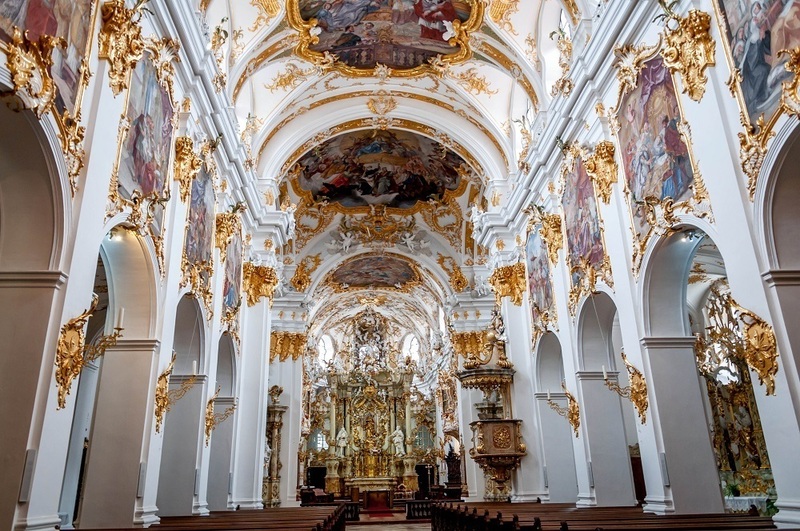 The Alte Kapelle looks so unreal! Absolutely gorgeous! I haven’t heard of this place before but definitely on my radar now. I am planning a trip to German in 2016 (I know it’s pretty far out) for my boyfriend’s 30th. He’s fascinated by the history of WWII while I am interested in the food and art. 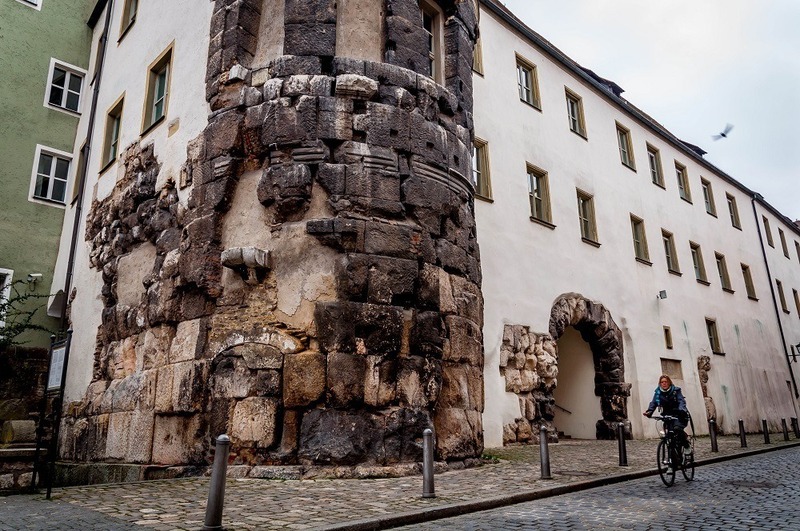 Regensburg looks and sounds like a perfect place to get our fill of history, architecture and art. Murissa, a trip to Germany in 2016? My, you really plan ahead. Laura and I are still trying to figure out where to go this fall. 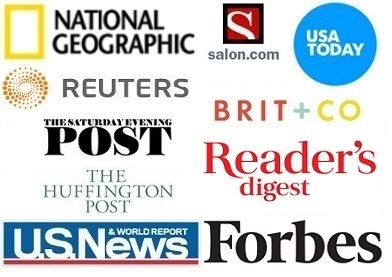 So many places in the world to pick! Germany is great and I find myself going back over and over again. I’m glad that you shared this post with us! 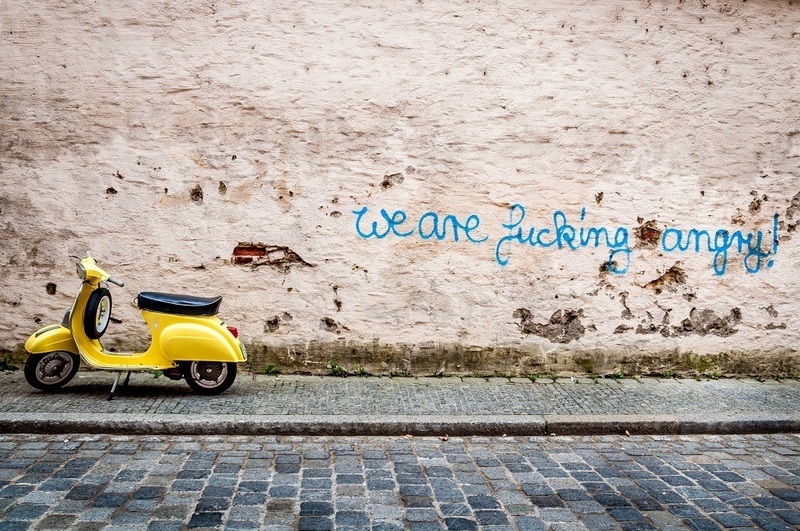 It sounds like such a beautiful city steeped in heritage and history.